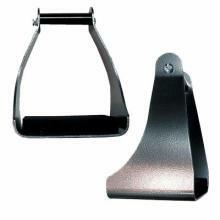 Shenandoah Trail Stirrups provide extra support and comfort - especially for long rides. These stirrups are made with lightweight aluminum and feature shock absorbing treads for comfort and to prevent feet and ankles from tiring quickly. Wide enough to accommodate insulated boots or tennis shoes. Available in the following neck sizes: 1½",2", 2½", 3"
Available in Brown or Black Aluminum.